A Boeing 737-823, registered N977AN and operated by American Airlines, sustained substantial damage in a runway excursion accident on landing at Kingston-Norman Manley International Airport (KIN), Jamaica. There were six crew members and 148 passengers on board. Fourteen passengers sustained serious injuries. Flight AA331 operated on a scheduled service from Washington-Ronald Reagan National Airport, DC (DCA) to Kingston with an intermediate stop at Miami International Airport, FL (MIA). The flight left Miami at 20:52. The flight crew reported that they briefed for arrival at Kingston prior to commencing descent from FL370. During the briefing for the approach they decided that, based on the weather and the minimums for the straight in approach to runway 12, it was a better option to do the straight in and land on 12 with a tailwind, rather than doing a circling approach to runway 30 with a low ceiling, and that this had more likelihood of a successful outcome. The flight crew believed that if the runway was more than 8,000 feet, and the tailwind was 15 knots or less, on a wet runway it was not necessary to calculate landing distance before each landing. Since runway length at Kingston was 8,900 feet no calculations were made. Descent clearance was received at 21:51. At 22:03 the flight contacted the Approach controller, stating that they were descending out of FL190 for 15,000 feet. The Approach controller responded advising AA331 that they should expect an ILS runway 12 approach, gave the altimeter setting as 1014 mb, and cleared the aircraft to descend to and maintain one five thousand feet. Weather was reported as "visibility five miles and there is moderate rain at the station ... wind three two zero at one zero knots..."
At 22:14 the Approach controller cleared AA331 to maintain four thousand feet, and on reaching KEYNO cleared for a straight in ILS approach runway 12, and advised that the wind was now 320 degrees at 15 knots. AA331 contacted the Manley Tower controller at 22:17, reporting inbound on the ILS for runway 12, level at 2,800 feet. The Tower controller responded advising them of the wind as 320 at 12 knots, and asked if they were still requesting runway 12. AA331 responded affirmatively and asked for the wind again. The Tower controller responded with the wind at 320 at 14 knots. The Tower controller then cleared AA331 to land on runway 12, and stated "... be advised runway wet". The flight crew started getting ground contact intermittently below 2,000 feet, and consistently below 1,500 feet. The aircraft broke out from the clouds at about 1,000 feet and had the runway in sight, which was well above minimums for that approach, and maintained visual contact with the runway throughout the approach. They were still receiving rain, and the wipers were turned on. The aircraft was configured early at 1,000 feet, and was on the ILS glide slope. The first officer was monitoring the tailwind on the navigation display and the tailwind component was dropping as they descended to the final approach fix, where it was about an 8-9 knot tailwind. At about 550 feet, the captain disconnected the autopilot and left the auto throttle engaged. The localizer of the ILS serving runway 12 was offset three degrees north of the runway track, and hence did not bring landing traffic to the touchdown point, so at the pilot had to transition to approach and runway lighting cues and make a very slight left turn to line up with the runway centerline. The aircraft was equipped with a Heads Up Display (HUD), which the captain used for final approach and landing. about 35 feet above the runway and closed the throttles to idle. The FDR data showed the aircraft pitching slightly nose up as it passed the threshold at about 70 feet radio altitude (RA), which reduced the descent rate. The captain turned off the autothrottle manually as the nose pitched up, about 4 seconds after threshold crossing, and the throttle levers were reduced to the flight idle stop about 14 seconds after threshold crossing, which was 3,800 feet down the runway. The float continued as the aircraft passed the PAPI lights at about 38 feet RA, where it should have been on the ground in a normal landing. The shallow rate of descent was maintained for about ten seconds until touchdown, which occurred at 4,100 feet down the runway, or 1,130 feet beyond the touchdown zone, as defined by AA Flight Manual. At least two pitch-up control wheel inputs were recorded by the FDR during the prolonged flare. The aircraft touched down at 148 knots indicated airspeed (KIAS) and 162 knots ground speed, with a 14 knot tailwind component and a 7 knot crosswind component from the left. The spoilers deployed at wheel spin up on the first touchdown, the aircraft bounced once and then landed again 200 feet down the runway, then autobrake 3 activated at about 4,600 feet from the threshold. The first officer called the ground spoiler, deployment and reverse thrust engagement. The captain stated that the aircraft was not decelerating as expected using autobrake 3 and he overrode the autobrake system, applying maximum manual braking on the brake pedals, and selecting maximum reverse thrust with the thrust levers. He was joined by the first officer simultaneously applying maximum manual braking on the brake pedals. The wheel marks on the runway indicated that the aircraft nose wheel drifted about twenty feet (six metres) left of centerline as the aircraft approached the end of the runway. The flight crew was unable to stop the aircraft on the remaining runway and the aircraft exited the end of the runway at 62 knots ground speed. The aircraft then passed through the chain link airport perimeter fence, crossed above the road located about 12 feet below the embankment at the end of the runway and came to rest on the sandy and rocky shoreline area located there, east of the airport boundary. There was no warning of the impending impact, and no brace command was given. The flight crew reported that after the aircraft came to a stop the cockpit was dark, and they completed the emergency evacuation checklist. 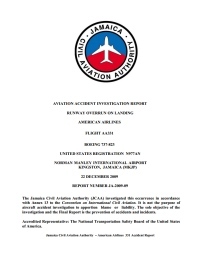 The investigation determined that the most probable cause of this accident was that the aircraft touched down 4,100 feet beyond the threshold, and could not be stopped on the remaining runway. The flight crew’s decision to land on a wet runway in a 14 knot tailwind, their reduced situational awareness and failure to conduct a go-around after the aircraft floated longer than usual contributed to the accident. Distance from Miami International Airport, FL to Kingston-Norman Manley International Airport as the crow flies is 940 km (587 miles).